Columbia Police Chief W.H. ‘Skip’ Holbrook announces the arrest of a burglary suspect accused of breaking into a discount store and stealing an ATM. 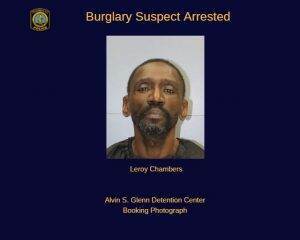 Leroy Chambers (DOB: 12-1963) is currently detained at the Alvin S. Glenn Detention Center (ASGDC) charged with Second Degree Burglary, Safe Cracking, Grand Larceny, and Malicious Injury to Property. Chambers and alleged accomplice, Mario Jackson (DOB: 2-1974) who was previously arrested are accused of smashing a truck through the front wall of the Family Dollar store located at 7416 Garners Ferry Road on January 15, 2019. Once inside, they allegedly stole an ATM. The Richland County Sheriff’s Department (RCSD) aided in Jackson’s recent capture.